We are currently seeking senior individuals of integrity and high reputation to join the committees listed below for a term of 3 years, from 1 January 2019. The nomination period will be open from 4 June to 3 August 2018. 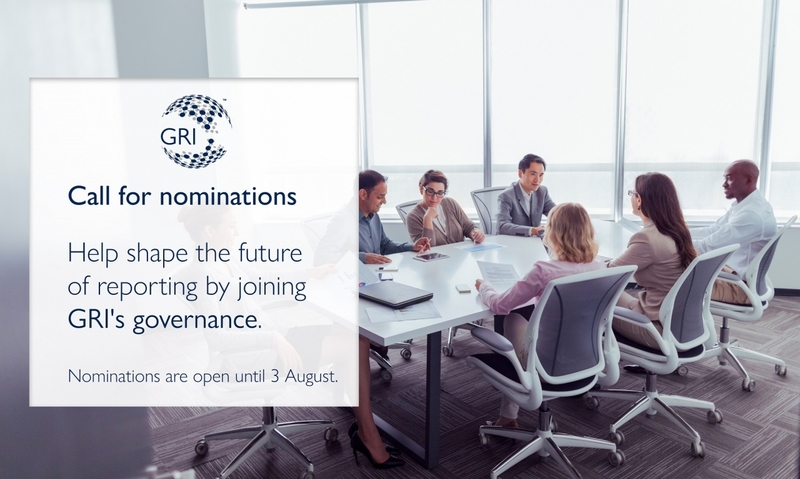 The dedicated members in GRI’s governance bodies provide counsel and guidance to help GRI carry out its mission. For the past two decades, our governance bodies have helped us pioneer sustainability reporting, and to develop the world’s most trusted and widely used reporting guidance. More recently, GRI transitioned into a global standards-setting organization, launching its first set of Sustainability Reporting Standards. GRI’s governance bodies were instrumental in this endeavor. Click below to find out more about the roles, current members and the details on the nomination process and forms to apply. The Board of Directors is the final decision-making authority at GRI. The Stakeholder Council is the formal stakeholder policy forum within the GRI governance structure, and advises the Board on strategic issues. The Independent Appointments Committee appoints members to GRI’s standards-setting governance bodies. We warmly encourage all our stakeholders worldwide to review the opportunities to get involved and spread the word as widely as possible. For more updates from GRI, subscribe here to our monthly newsletter.